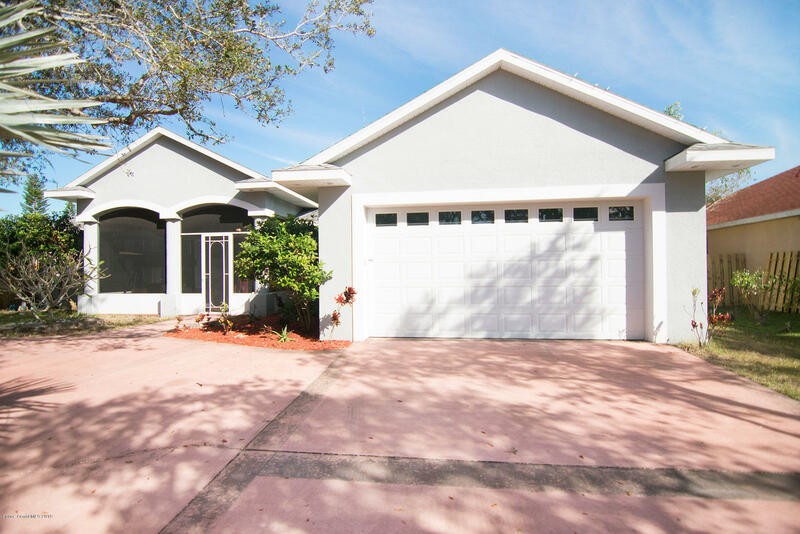 Beautiful 4 bedroom, 3 bath, 2007 built home on City Water in quiet neighborhood of Fairhaven in NE Palm Bay. Circular drive, oversized 2 car garage, screened front porch with brick flooring. Bamboo flooring throughout the main living areas, Family Room with a fireplace, gorgeous Kitchen with Breakfast Bar and huge eat-in island with lazy susan and plenty of storage, granite counters and backsplash, 42'' wood cabinetry, wine rack over the fridge, vaulted ceiling and architectural touches, 8 foot doors, tray ceilings and crown moulding in 3 of the bedrooms, Master Bath with granite counters, 2 vanities, spacious walk-in shower and separate soaker tub. Indoor Laundry Room with laundry tub and granite counter. Covered back porch overlooking fenced backyard. Come take a look!